Zanu-PF Politburo member Senator Josaya Hungwe has hailed the corporate world and other well-wishers for responding swiftly by making donations to victims of Cyclone Idai in Masvingo Province. At least five people died and 5 300 houses were destroyed by the cyclone in the province. According to statistics compiled by the province, 17 injuries were reported in Zaka, while a roof was blown off at some cells at Mutimurefu Prison. Several organisations donated goods including food stuffs and clothes to the affected families. Chivi South legislator Cde Killer Zivhu chipped in with 30 000 bricks for the construction of houses that were destroyed by the cyclone. Cde Zivhu came up with the idea of mobilising the donations and sold it to his colleagues. Speaking at the handover ceremony of the goods at Masvingo Civic Centre on Saturday, Sen Hungwe said: "I want to thank all those who have donated towards this cause. This is the spirit that we want as Zimbabweans. "I want to say that we don't want corruption and these goods should reach the intended beneficiaries as soon as possible. As the people of Masvingo, we are grateful to all those who extended their helping hand to our colleagues who were affected by this natural disaster." Sen Hungwe hailed Cde Zivhu for proposing the idea of helping those affected by the cylone in Masvingo. "I want to pay tribute to Cde Zivhu and FBC chief executive Dr John Mushayavanhu for coming up with this brilliant idea," he said. "We organised this in three days and the response that we got was overwhelming. I want to thank Dr Mushayavanhu of FBC in a special way for leading in this noble initiative." Masvingo Provincial Affairs Minister Cde Ezra Chadzamira said: "I want to thank all those who have donated. As a province in light of devolution which is coming, we should have a fund that we should set aside to help our people in times of disaster like this. "These goods should reach to the affected families and we do not want people who take advantage of this unfortunate incident to enrich themselves." 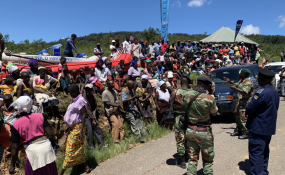 Speaking on the sidelines of the donation, Cde Zivhu said: "As one of the sons of this province, I was touched when I received the news that some of our people were affected by Cyclone Idai. I thought it will be prudent to chip in and contribute towards those who were affected." He said the bricks that he donated were ready be transported to the affected families.